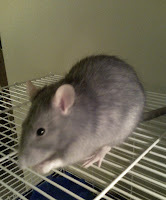 As you may know, I have a pet rat. No, no, stop with the jokes right there. The weirded-out look is fine, ‘cause I get that in person a lot. There are only two real reactions: the ‘oh my gosh, this person seemed normal but just turned really crazy’ one, or the ‘oh yeah! 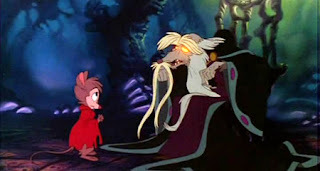 we had a rat when I was a kid. aren’t they great?’ option. I leave you to figure out the majority side. These same friends who look askance at my pet often forward articles on rat experiments (weird peace offerings?). The latest of these comes from Wired.com, and tells how blue dye can heal spine injuries. Check out the hilarious photo! T/F: I should attempt to dye Melli blue. We had guinea pigs and I guess their not that far from rats, but I still can't get used to the idea of rats as pets. 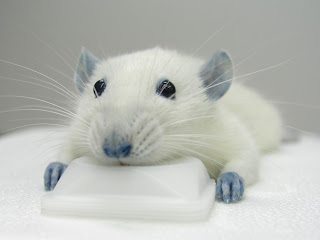 Dying your rat blue sounds like a fabulous idea. Perhaps polka dots would work- - a la The Royal Tenenbaums. Yeah, rats aren't that far from hamsters, which we had. When we moved, each of our cage bound animals, at that time a hamster, which has since died, and a gecko, which is still alive, road in their cages on someone's lap. Granted it was just across town.